Reunited with some taxidermy that I packed and moved onto these shelves in 2013. Like many early career people these days, with heady dreams of becoming a curator, I first joined the museum team as a member of Front of House and a casual Learning and Community Engagement Assistant. I also volunteered one day a week with the collections and curatorial team. My first big task here was helping with a collections move – the picture is me reunited with some taxidermy that I packed and moved onto these shelves in 2013. About 18 months ago I left to work for the Pitt Rivers Museum as a Collections Assistant for a couple of projects – including a collections move! In fact, I am still there for half the week working on another project, which I am shamelessly going to plug here. It has been wonderful returning to the HCW team and seeing how the newly refurbished Market Hall Museum is being received. 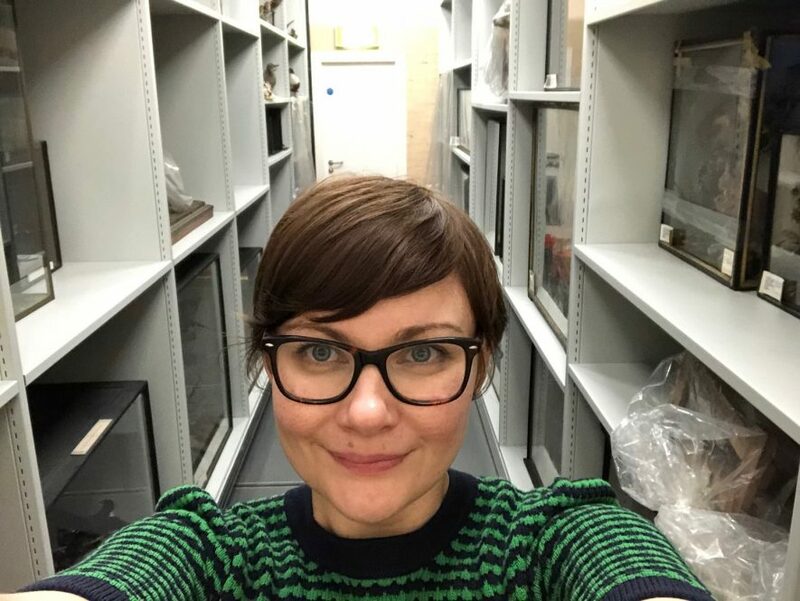 During my time, I worked across most of the departments that make up HCW and it is a pleasure to be back amongst a team that, in numerous ways, nurtured and helped me develop – and the fantastic collections don’t hurt! Great to have you back, Abi!